« The Iraq War Spending Bill: How They Voted. Here’s how you get to worst President ever. 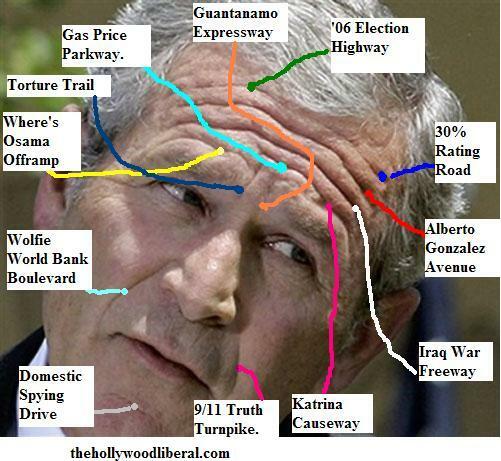 Take Iraq War Freeway South, to the Katrina Causeway South, to the Guantanamo Expressway South, to the Gas Price Parkway South, to the ’06 Election Highway South, to the 9/11 Truth Turnpike South, get off at the Where’s Osama? Offramp, make a right on Alberto Gonzalez Avenue, another right on Wolfie World Bank Boulevard, take that to Torture Trail South, and that will take you right to 30% Rating Road. You can’t miss it. This entry was posted	on Saturday, May 26th, 2007 at 3:23 pm	and is filed under Latest Comics, Main Blog (All Posts). You can follow any responses to this entry through the RSS 2.0 feed. Both comments and pings are currently closed.